I don’t like pancakes. I repeat: I don’t like pancakes! They are my least preferred breakfast option, but regardless of that preference, I decided to make these Zephyr Pancakes for my kids one night for dinner when my husband was gone all evening. And I could not stop eating them. Really. I ate at least 5 (ok, 7). True to their description (from the King Arthur Flour Baker’s Companion), they are “incredibly light and tender and literally melt in your mouth.” They are so, so delicious. Granted, they aren’t the healthiest pancake around, but I gladly ignored that while I gorged myself. Maybe next time I’ll add whole wheat flour to make myself feel better. In a medium-sized bowl, whisk together the flour, sugar, baking powder, baking soda, and salt. In a separate bowl, whisk together the egg yolks, cream, buttermilk, melted butter, and vanilla. Whisk the wet ingredients into the dry, just until combined - it's okay if there are a few lumps. Preheat and lightly grease (I didn't grease my griddle and they didn't stick) a heavy skillet or griddle. Scoop the batter onto the griddle with a 1/4 cup measure or a large spoon. Make sure the heat is slightly less than medium. The pancakes will puff up very high. When the first side is golden brown and the edges start to look dry, turn the pancakes over to finish cooking the second side. Remove the pancakes from the griddle and keep them in a warm serving dish until you have enough to feed everyone. These are a favorite at our house! We make them often. I really wish you would put how many servings in your wonderful recipes. Yep, like Jessica said…the yield is right above the recipe title. After trying your sour cream pancakes (which are good! ), I realized I never commented on your zephyr pancakes. We have been making and loving your zephyr pancakes for years and the only change I made is using 2% milk instead of buttermilk. Your zephyr pancakes are the best! Thanks! Could I make the batter in the afternoon, keep it in the fridge overnight and cook the pancakes in the morning ? I haven’t tried that but I think it should probably work. Mine barely puffed up 🙁 I used almost half WW flour, do you think that is the reason? I tried not to over mix but maybe that was it also…. I’m not sure, Tina, but whole wheat flour may make them more dense so they don’t puff up quite as much. Wow! I also dislike pancakes, but of course my children very much adore them. I usually buy the frozen pancakes to appease them quickly.. Today is my son’s birthday though so I decided to make these pancakes and WOW! I didn’t even put syrup on them they tasted like little cakes! I added mini chocolate chips to a few of them – and that was even better (and even more fattening I’m sure!). Is heavy cream the same as heavy whipping cream in this recipe? Would it make a difference or would the results end up the same?? Viktoriya – Yep, heavy whipping cream is the same as heavy cream. DELICIOUS! I don’t like box mix and the homemade, go to recipe I had before this one was more work using fluffy egg white this one is much easier and tastier thank you!!! I am a total pancake snob, and these are truly amazing. I was a skeptic making these the other day and I should know by now “in Mel I trust”. The batter comes out thicker than most batters, but you end up with an extremely light, fluffy, and delicious pancake. Thanks for another amazing recipe! try eating pancakes with sweetened condense milk instead of maple syrup…yummy!!! You never fail Mel! I had some heavy cream, milk and eggs to use up, and we LOVE pancakes! I normally make your oatmeal pancakes, but these were a nice treat. Rich, creamy, light, melt in your mouth. YUMMY! Very tender, melt in your mouth goodness. Thanks for the recipe. I love your recipes. You are usually my first site I go to when I need a yummy recipe especially desserts. If only I could learn how to make bread like you do. I guess i need a lot more bread making practice. Magical! Subbed white wheat flour and chucked in a few bananas and mini chocolate chips-and topped with the buttermilk syrup posted above- FAB! Kids in heaven on cold night after dance carpool! I have spent years searching for the perfect pancake recipe. I do not enjoy flat pancakes at all, they have to be puffy and tender. TADA! Mel has the perfect recipe right on her site, I should have known. These are soooo tender and perfectly puffy. Definitely decadent, especially with buttermilk syrup :). These were amazing! My kids literally inhaled them, I have no idea where they went. Made two small tweaks – used white whole wheat for half the flour called for and added 2 tbsp of ground flaxseed. They were incredibly light especially when you consider the ingredients! This will go into our regular rotation. Thanks! I usually prefer french toast to pancakes but these pancakes were delicious! Made them this morning and my son and husband loved them! I have tried a few different homemade pancake recipes in addition to pancake mixes from Williams-Sonoma and Stonewall Kitchen but these tasted the best! Thanks! We made these for dinner tonight… with choc chips and whipped cream. OMG!!! These are absolutely the best pancakes I have ever eaten!!! So so so good!!! My husband said he didn’t think pancakes could ever taste so good. None of us are huge pancake fans but these are amazing!!!! tanya – it sounds like you took these pancakes to a whole new level with the chocolate and the whipped cream. Delicious! We love pancakes but I have never in my almost 50 years of life ever made them from scratch. I have made these for the past two Sundays and my family LOVES them. I will never make them from a box again. These are just perfect pancakes. Light & fluffy. Thanks! Can I substitute the milk-yogurt for the buttermilk? alexandra – I’m sure you could substitute a milk-yogurt combination for the buttermilk. I’ve seen that in recipes sometimes as a substitute. I’ve never used it before so I can’t vouch for the results. alexandra – thanks for letting me know the milk-yogurt substitution worked out ok. Thank you for the comment! I did use the milk-yogurt substitution and the pancakes turned out wonderfully. These were the best I have ever had! I am systematically going through your recipes for all our meals. So glad you liked them, Leigh Anne! Thanks for posting back with the results. Jenn – glad you liked them. Out of curiosity what did you use in place of the cream? These look so fabulous! I’m glad you liked them to much. We’ll have to try these at our house! That look like the perfect stack of pancakes. I could eat pancakes for every meal of every day and be satisfied. I’m glad you found some that you can gorge on! Just beautiful! I made these tonight, adding in some blueberries, and they were sooooo good! By far the best pancakes I’ve ever tasted!! My husband said they would put the local amazing breakfast restaurant out of business. 🙂 Thanks! We had these for breakfast, and you are right – the texture is so light and airy. I’ve never had pancakes with a texture quite like that. I cooked the three leftover egg whites and gave them to Benjamin and he enjoyed eating those while Jed and I ate the fattening pancakes! Hhhhmmmm, maybe I should be the one eating the egg whites instead!! Brynnly – your comment made my day. Thank you! I love the 24 Hour Menu site, too, so the feeling is mutual. I’m glad you liked these pancakes – they are a family favorite. Well, unlike you, I LOVE pancakes. I could eat them for every meal, and these look scrumptious!!!!! Hey Jenn – thanks for the results! I liked knowing how regular milk worked and it sounds like they are still delicious with milk instead of cream – but if you want to splurge, cream is the way to go! Glad to know there is another mom making it with four boys! 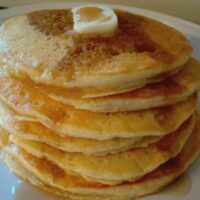 Jenn – I love buttermilk syrup and have a very similar recipe. Thanks for sharing this! I’ve made these twice since Christmas. The first time with cream (since it was Christmas) and today with just regular milk instead of cream. Thought I’d report my findings.The ones with the cream are melt in your mouth soft. Great for a special breakfast. The regular milk, a little different, but they are still really good. They would be great on a regular day when you don’t want to splurge the calories and fat. And good luck with four boys–that’s what I’ve got. Although I wouldn’t change it for the world, they are full of energy and nothing stays nice or in one piece forever. They are great and they love their mom, but I’d also like a peaceful, non-wrestling day every once and awhile.Best wishes!! Allison – that’s high praise from your husband! Thanks for letting me know you liked these – I bet they were awesome with the blueberries! 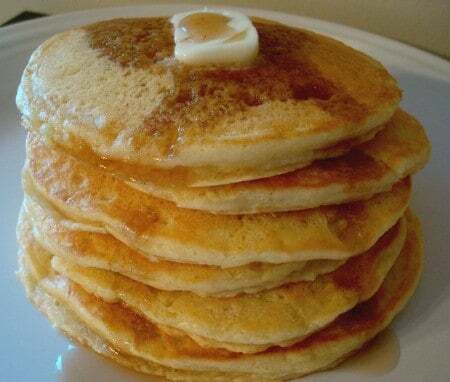 I love when pancakes puff up like that, they look delicious! I love your blog! I made these yesterday for my whole family and everyone loved them. They really do melt in your mouth. I doubled the recipe and actually ran out of pancakes!Thank you thank you for sharing such amazing recipes! Seriously – you don’t like pancakes? I thought everyone loved pancakes!! I’ll have to give these a try, as my last pancake attempt was less than perfect. Okay, made these today. They were great (even if I didn’t have the cream to make them). I think this will be crowned my go to pancake recipe! Thanks again. I have to confess I don’t like pancakes either. I am going to be serving these though to friends soon and I am excited to try them myself. Thanks for posting the recipe! Hi Mel. These are great. Have you tried these: http://thepioneerwoman.com/cooking/greek-yogurt-pancakes/ Theyre kind of the same idea with the extra dairy fat and being light and fluffy, but the Greek yogurt adds a great tang and a bunch of prots. I add a little extra flour to bind them together for easier flipping. Thanks for your recipes; this is the only time I’ve posted but you’re site has been my go-to for several years. I haven’t made those, but they sound yummy!